There are ideas, and then there are HUGE ideas. Virgin founder Richard Branson is no stranger to big ideas. Anyone who can develop a brand and turn it into a record company, chain of Megastores, mobile phone provider, hotel, and airline deserves serious applause. 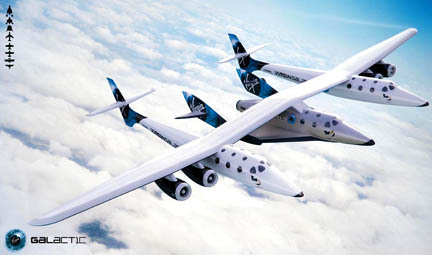 Yesterday, Branson outdid himself with the launch of WhiteKnightTwo, a carrier airplane that will launch Virgin Galactic passengers 50,000 feet above Earth’s atmosphere. They hope to be the world’s first environmentally friendly, private spaceflight airline. Talk about ambitious! Companies like Virgin Galactic are inspiring because they teach entrepreneurs and creatives to be hopeful and relentless in pursuing their visions. It’s possible to expand a mail order record store into a groundbreaking, aeronautical venture. For the aspiring astronauts, sign up for a window seat on the Virgin Galactic website if you have the time (there’s a waiting list, and flights aren’t projected to begin until 2009-2010) and money (roughly $200,000).